Current design choices include bringing a touch of nature inside, with natural stone tile. 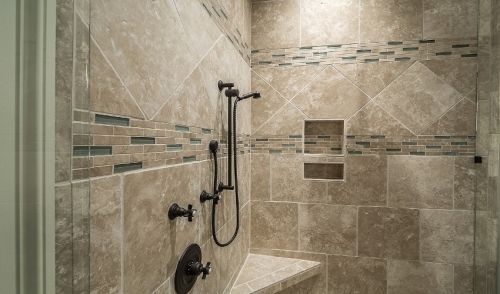 The tile industry has come a long way in making exotic materials accessible to the average homeowner. Various types of granite and marble from faraway places such as Brazil and India have been making their way into people’s homes. Innovations in stone cutting techniques are making stone tiles available in larger formats for floor and wall applications. Stone is available in a variety of decorative and trim pieces as well. Porcelain tile, thanks to advancing digital technologies, is now made to mimic natural materials in even more detail. Lines of texture within the tile are now made to resemble the patterns of stone and wood with more authenticity. The patterns of veining and grain in the tile are done in such a way that is not replicated, just as it is with true natural materials. For those seeking a modern look for their bathroom, solid colors, namely black, is a growing trend in bathroom tile. Sophisticated, contemporary bathrooms are incorporating black and its many shades to produce a clean, simple look for those with the minimalist appeal. Along the same spectrum, mosaic tiles that incorporate black and its shades, allow for staying within the latest trend but also introduce a bit of flair. Glass tile is becoming more popular. For example, manufacturers such as AKDO, Oceanside Glass Tile and Trend Glass Group are now making more options for glass tile in larger formats, as well as mosaics. Incorporating large-format glass tiles for shower walls and complementing with like-colored mosaics, results in a combination of sleek durability that many customers are looking for. As an added benefit, customers are happy to know that many glass tile manufacturers use up to 50% post-consumer recycled glass in their manufacturing process.